I recently attended a book launch my mother participated in, contributing with one of her stories. In fact her story is the start of a novel that has taken her 17 years to complete. The tinkering sound of guitar strings accompanying “soul” food and creative company set a relaxed tone for the evening. 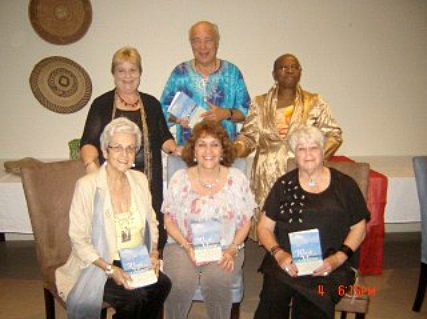 The group’s mentor Dorian Harhoff, poet and story teller, was a Professor in English in Namibia and is the author of “The Writers Voice”. He brilliantly encouraged the creative process of writing from what is often called from the “heart”. This manner of creativity spoke to my already gathered knowledge that art in any form is an invaluable tool towards healing. These KZN writers shared parts of their stories. Powerful and fresh from their experiences. One of their tasks that evening was to also read part of a story by a women from one of the other two groups – JHB and CT. It became evident that these women found identification in the sharing and a newfound belonging amongst themselves. Easy Therapy within this obviously nurturing and “safe to share” group. A look at Joan Martin at Fat Tuesday. This entry was posted in Uncategorized and tagged Book Launch, Victoria Cardoso. Bookmark the permalink. Post a comment or leave a trackback: Trackback URL.